There's a picture in the center, foldout spread of the Doughboys' new album Act Your Rage, and it says it all in an up close, fisheye lens-styled blast of garage verite: Myke Scavone, his left arm extended with index finger pointing, emphasis on the musical soul of this longstanding New Jersey band, and in the back, his skins flexing the length and width of a blanket baffle, sits Richie Heyman, bathed in spotlight white, his legs alternating between cymbal hits, snare smacks and tom fills. In the moment, this is the garage, and the moment is preserved in black and white because color just won't cut it. Garage rock is a black and white medium, because it's blinding, pulsating and dizzying as it bumps and grinds with emotive clout, the songs playing like each one is the last, and if life were fair, it might well be, but the fairness of life is meandering and there lies the secret of its black and white heart. Its focus is all its own, a demanding presence jumping from the CD player like lightning bolts aimed at the nerves. The Doughboys, on their second long player, aim at the nerves and get them jumping, and what more can you expect? 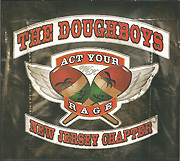 This is the sound of garage rock in 2010; these are the Doughboys, New Jersey's saviours of rock 'n' garage soul. The group is no more wired than on Heyman's wild anthem "Sidetracked Again," dicing and slicing the melody and rhythm left and right, Scavone spitting the vocals like he means it, like no other committed vocalist could. And Scavone's blues harp, punctuating where it must, just sends the whole enterprise around the circle with an engaging ferocity, as do Heyman's drums on Ray Davies' "It's Alright." The blues train's a-comin' on guitarist Gar Francis' pumping "I'm Not Your Man," with more of Scavone's punctuating harp blowing. The Doughboys play it like they mean it, and they have to--it's their credo, playing it like they mean it, like they do on the alternatingly bluesy and poppy Animals groove of Francis' "Nobody's Girl." On the slow and soulful "Carmalina," Scavone sings the pain of regret as he seeks to get his girl back in finest Mick Jagger tradition. Also in Stones mode, the boys rock out on Heyman's rock 'n' roller "I'm That Kind of Man," a tune with hair on its skin and power in its pop. The album closes with a left-field cover of the Moody Blues chestnut "Tuesday Afternoon," putting a garage rock sheen on Justin Heyward's classic that you may not see coming, but there it is, and it is good like you know it will be. First played at Heyman's wife Nancy's birthday party, it sounded so good it stayed in the live set, where it belongs, and here, on Act Your Rage, where it also belongs in the great musical company surrounding it.